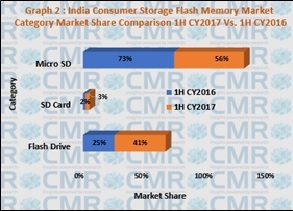 The overall India Consumer Storage Flash Memory market, comprising Micro SD cards, SD cards and Flash drives, witnessed 53% decline in 1H CY2017 as against 1H CY2016, in terms of units shipped. Micro SD as always was the flag bearer of the Consumer Storage Flash Memory market growth and the leading contributor to this market. However, when compared to 1H CY2016 this category witnessed phenomenal 64% decline in terms of unit shipments in 1H CY2017. The rising trend towards launching mobile phones with higher internal memory has influenced Micro SD market a lot. 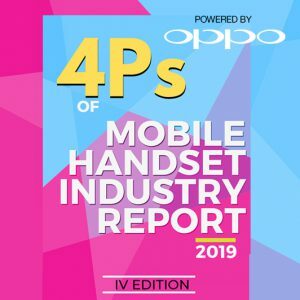 Although streaming and downloading videos, entertainment and gaming apps, and other apps will require more memory provoking the video hungry consumers to buy Micro SD cards. 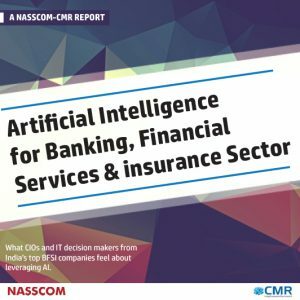 Similarly, Flash Drive and SD cards market also witnessed 22% and 36% decline in 1H CY2017 respectively when compared to 1H CY2016 in terms of units shipped. Large and expandable internal memory storage capacity, high resolution camera like features available in nearly all smartphones available at various price bands have led to the decrease of SD card and Flash drive market. 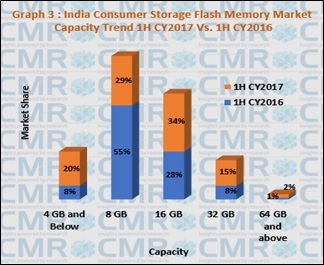 Demonetization implemented at the end of CY2016 led to the slow growth of overall Consumer Storage Flash Memory market in 1Q CY2017 initially, however the overall market later revived and witnessed 5% growth in 1Q CY2017 when compared to 4Q CY2016 in terms of units shipped. Likewise, in 2Q CY2017 the market seemed positive until May 2017. The sales were largely affected in June 2017 because of current Modi Government’s plan to introduce GST in July 2017.The plan to launch GST forced the brands to buy very limited stocks which they could sell in that same period. The overall market witnessed 8% decline in 2Q CY2017 when compared to 1Q CY2017 in terms of units shipped. 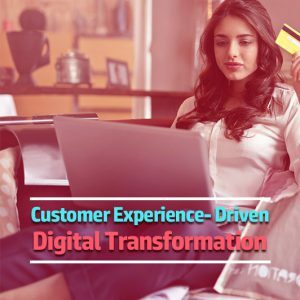 Unaffected by the rise and fall of the overall Consumer Storage Flash Memory market in 1H CY2017, SanDisk continued to be the top contributor in all the three categories contributing 31% share to Micro SD,64% share to Flash Drive and 68% share to SD cards category in terms of unit shipments. SanDisk’s Cruzer Blade (SDCZ50) was the top favorite Flash Drive Model in 1H CY2017. 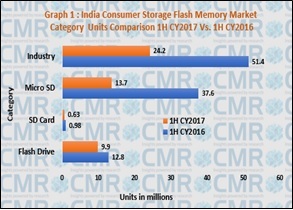 Overall Consumer Storage Flash Memory market in 1H CY2017 saw movement towards 16 GB capacity segment. This capacity segment was the largest contributor with 34% market share in 1H CY2017 in terms of units shipped. 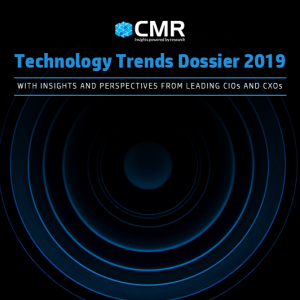 Going forward the market will witness a shift towards higher capacity segments because of almost all major vendors moving towards implementing 3D Flash Technology in their manufacturing process. Lucrative offers floated by different brands going upto the festive season and sellers buying the usual stocks after the dust being cleared around GST is expected to pace up the sales in 2H. Customers eagerly wait for the arrival of festive season to avails huge discounts and offers. As such, 3Q CY2017 is expected to witness more positive growth. When one looks at the general annual trends for 4Q, the forecast is that the overall Consumer Storage Flash Memory Market will see muted growth, with less sales as all major festivals are over by then. Micro SD will continue to lead the market followed by Flash Drive at second and SD cards at third spot in 2H CY2017.